ExxonMobil acknowledged Tuesday that Hurricane Harvey damaged two of its refineries, causing the release of hazardous pollutants. The acknowledgment, in a regulatory filing with the Texas Commission on Environmental Quality, follows repeated complaints on Twitter of an “unbearable” chemical smell over parts of Houston. However, it was not immediately clear what caused the smell. The company said in the filings that a floating roof covering a tank at ExxonMobil’s Baytown oil refinery sank in heavy rains, dipping below the surface of oil or other material stored there and causing unusually high emissions, especially of volatile organic compounds, a category of regulated chemicals. The Baytown refinery is the second-largest in the country. The company said in its filing that it would need to empty the tank to make repairs, though it wasn’t clear when the weather would permit that. An ExxonMobil spokeswoman said the company would “conduct an assessment to determine the impact of the storm once it is safe to do so.” It would not say what was in the tank. At the company’s Beaumont petrochemical refinery, Harvey damaged a sulfur thermal oxidizer, a piece of equipment that captures and burns sulfur dioxide. As a result, the plant released 1,312.84 pounds of sulfur dioxide, well in excess of the amounts allowed by the company’s permits. A variety of other chemicals was emitted during the shutdown of the plants. 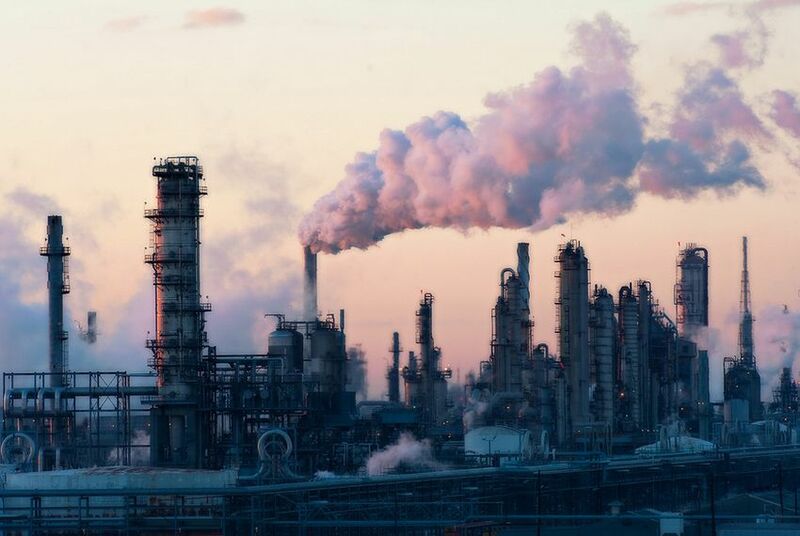 “Most of the unauthorized emissions come from the process of shutting down, and then starting up, the various units of the plant, when pollution control devices can’t be operated properly and there’s lots of flaring,” said Luke Metzger, director of the group Environment Texas. Flaring is generally done when releasing chemicals without burning them is more hazardous for people and the environment. ExxonMobil said it had flared hazardous materials at its Baytown refinery Sunday and Monday. Most of the other facilities belonging to major companies also filed notices with the Texas Commission on Environmental Quality. Chevron Phillips, for example, said that it expected its Cedar Bayou chemical plant to exceed permitted limits for several hazardous pollutants, such as 1,3-butadiene, benzene and ethylene, during shutdown procedures. Environment Texas and the Sierra Club sued ExxonMobil in 2010 alleging that the company’s Baytown complex had emitted 8 million pounds of hazardous chemicals over a five-year period. A federal judge imposed a $20 million penalty on the company. Disclosure: Exxon Mobil Corp. has been a financial supporter of The Texas Tribune. A complete list of Tribune donors and sponsors can be viewed here.